Anyone who was a grade school student in a United States public school recently inevitably did a report or paper focused on Arctic animals or the Arctic region in general. This area is a fascinating ecosystem at the northern end of the earth and is well known for its extremely cold temperatures, Northern Lights, and eternal summer as some call it. The eternal summer reference comes from the fact that during the summer months, the sun continues to shine in the Arctic, even through out what is normally considered nighttime hours. This remote location is the natural habitat for polar bears, Arctic foxes and wolves, caribou, and musk ox to name a few. Other Arctic animals that thrive in cold, northern temperatures include the snowy owl, collared lemming, Arctic hare, walrus, and narwhals (whales). Narwhals, also called corpse whales because they often float upside down on their backs for prolonged periods, travel slowly in Arctic waters in pods. As they travel, they communicate with amazing clicks, squeals and whistles so they can stay together. Narwhals eat squid and have an interesting and distinctive tusk that sticks out like a tooth on the whale’s head that can grow to about nine feet long. The caribou and musk ox are a main part of the Arctic diet for the people that live in areas of Canada, Denmark, Russia, Iceland, and Scandinavia. A musk ox is a member of the sheep and goat family and can grow to be a huge animal of almost a thousand pounds. This brown and bearded animal is highly visible in the Arctic while the polar bear and Arctic fox have the advantage of being able to blend into the white snow and tundra with their white fur coats. Although small, the Arctic fox has a huge advantage over the polar bear and arctic wolf thanks to its fur that keeps it warmer than most mammals. The fox even has fur on the bottom of its feet to protect it from the extreme Arctic cold temperatures. The native Arctic polar bear is considered the biggest animal in the bear family at an average of almost 9 feet tall. The polar bear actually has black skin under its white fur. 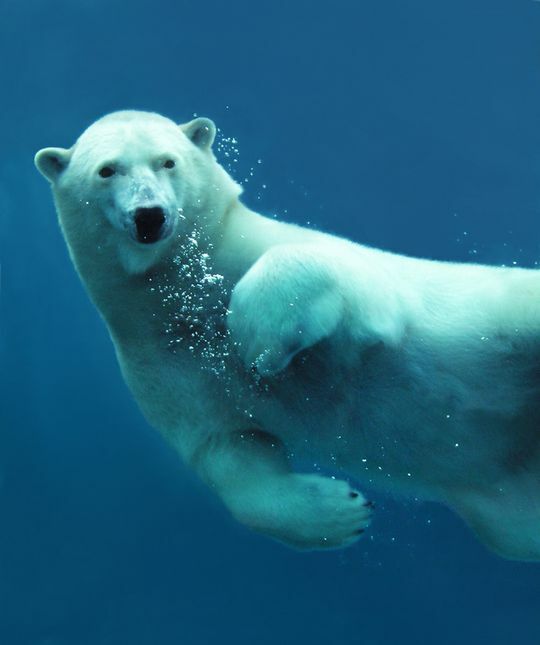 Although deceptively slow at times on tundra, the polar bear is an amazing swimmer and does about six miles an hour in the water. They prefer to live quite close to Arctic water so it can hunt for seals easily, so it’s important that these bears have similar conditions when they are in zoos.